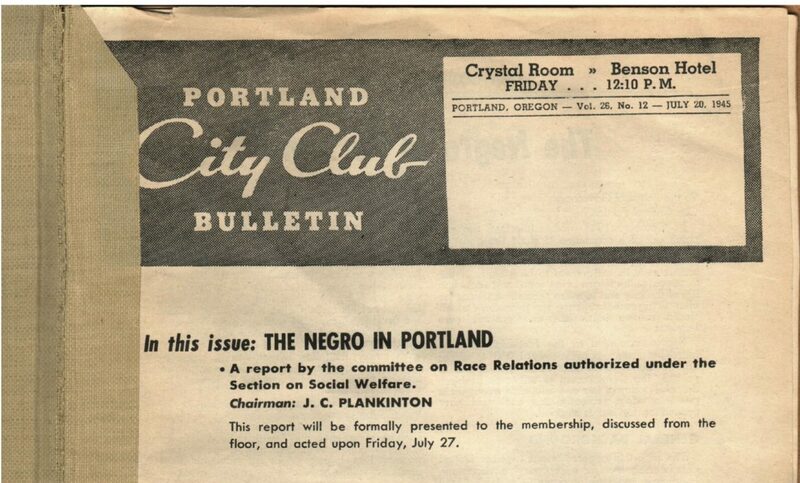 The cover of a 1945 issue of the Portland City Club Bulletin. The committee reported among its findings that many local diners “frequented by working men” sported placards reading “White Trade Only” and noted that “Portland is the only city on the coast where such signs are displayed.” It found that the congregations of the major protestant churches, like the staffs at the two daily newspapers, were all white, but that other employment opportunities were available to the county’s black residents. “While Negroes who want to work can obtain jobs, there is less tendency for them to commit acts that would bring them into conflict with the police,” the report said. That statement was at odds with the Club’s finding that black residents, who made up less than 2 percent of Multnomah County’s population at the time, represented 13.2 percent of those sent to the state penitentiary. The committee suggested the police department conduct “a course in racial tolerance” but found Chief Niles “showed a lack of enthusiasm” for the idea. Obviously we citizens need to organise ourselves to get this bill passed as one step towards police accountability. I will follow this closely and am willing to work with anyone who is also committed to ensuring justice prevail over injustice.